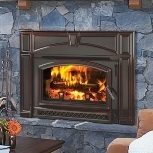 Quadra-Fire inserts provide an instant upgrade to any hearth. Designed to be retrofitted into an existing wood-burning fireplace, inserts upgrade efficiency and heat-producing capabilities to allow for a more powerful, cleaner burning fire. 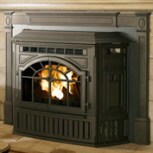 Fireplace inserts are a simple solution that facilitate more efficient room heating. 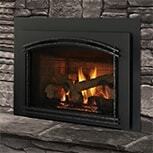 Get more out of your existing wood-burning fireplace with a wood insert from Quadra-Fire. For more than 30 years, Quadra-Fire has put performance and easy operation above all else. Designed with highest quality and durable components these inserts are built to last! as the fire ignites, it remains clear: NOTHING BURNS LIKE A QUAD. Quadra-Fire's pellet inserts are a more eco-friendly way to heat your room. All of our pellet inserts are designed with powerful performance in mind. They are a quiet and efficient heat source that provide clean and consistent comfort. Designed to fit into existing drafty and inefficient wood-burning fireplace, Quadra-Fire gas inserts heat efficiently and easily, providing the glow and appeal of a real wood-burning fire with the conveniences of gas. Start saving money now by turning down your furnace and zone heating with a Quadra-Fire gas insert.